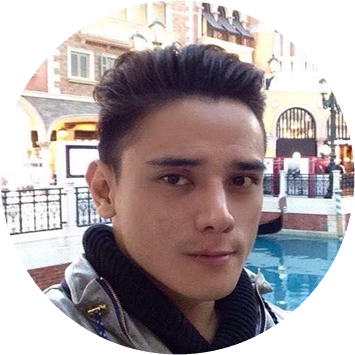 It’s been a long time since the last moment I set foot in BGC. And upon finding out that I was going to do this review for Craft, I got curious and excited about finding out what has changed over the years. Stepping in to the very same Craft that I knew, I was surprised to see a whole new interior with a nice red and black accent wall with a textured installation. A nice transition from the old, wooden white and brown wall to this new modern design – knowing of course that Craft has been around for five years now, and I hear that they’re still growing. 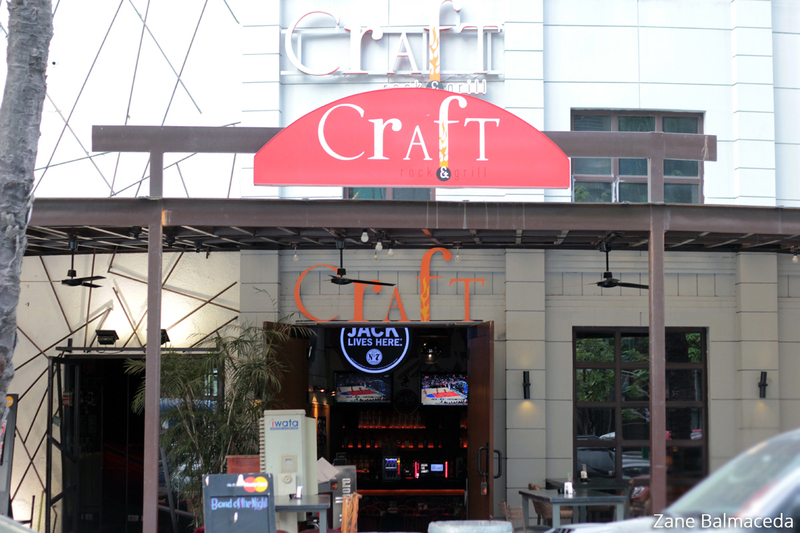 Craft is known for its fun and energetic vibe. A fine place to go to after a long day at work or maybe even just to chill with friends if you live nearby. Starting off soft and smooth, Craft opens its doors at 5:00pm and live music starts playing as the featured bands rock the stage from 10:00pm onwards. With a total sitting capacity of 80 people indoors. Al fresco (outdoor seating) is also available, but I wouldn’t recommend it during summer time. It’s just extremely hot. I was warmly welcomed by Howard, the Managing Director and Aisa, the Operations Manager. We shared a few drinks at the bar. 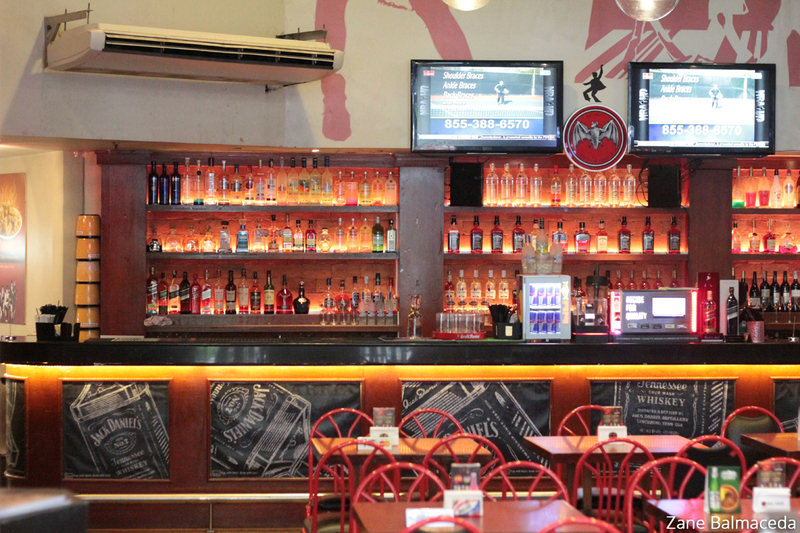 Their bar was well set-up with the widest array of wines and spirits you could ever want. We went on a quick tour around the dining area, the stage and the kitchen. Howard and Aisa took the liberty of ordering for us as we watched them coordinate the menu with the chef. I always like to see what’s happening behind the scenes. Then I was led to my booth and noticed that there were six flat screen monitors around the room showing soccer and volleyball matches. 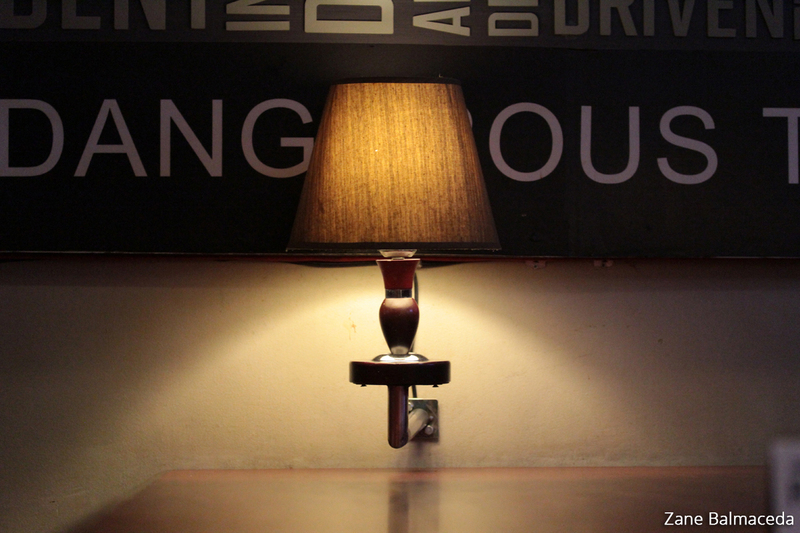 A nice little lamp at the end of my table completed a delightful mood for the evening. 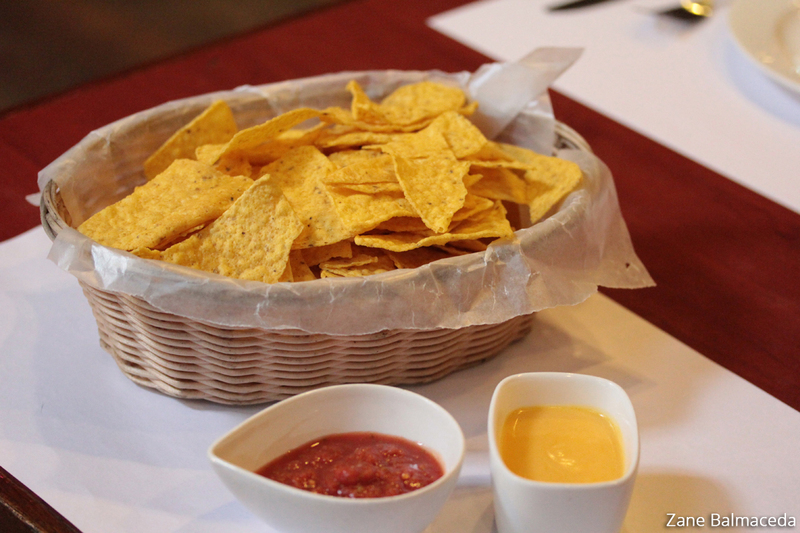 My team and I were busy taking photos of the nice new interior when our first plate arrived – Nachos with Salsa and Cheese Sauce. The serving size was huge. It was crisp and the salsa smelt like it was freshly made. I liked the mixture of the aroma of tomato and basil. I’m not sure if they make their own cheese sauce, but I liked both the salsa and the cheese. Quite a nice nachos experience. 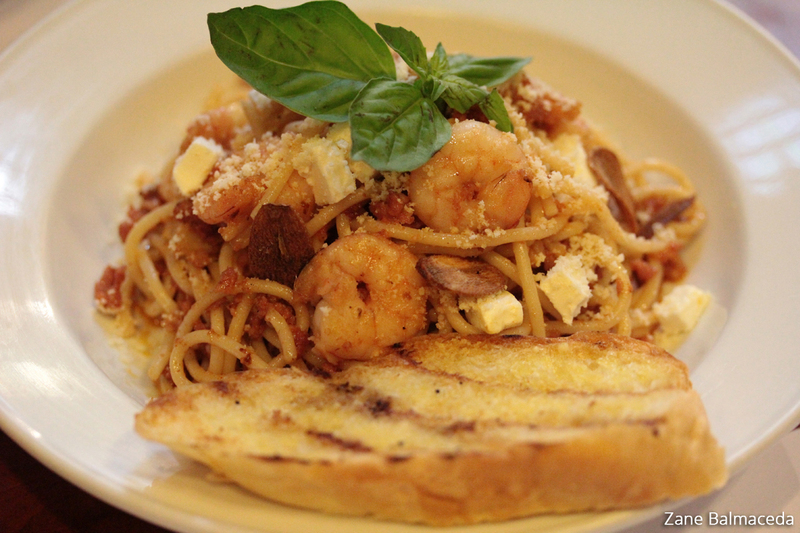 Next our kind server Ray, came to our table with a nice and steamy plate of Chorizo and Scampi Spaghetti – pasta with garlic sautéed shrimps, chorizo and feta cheese with a hint of spice. My palate was instantly wrapped with the nice flavour of chorizo at the very first bite. The oil balanced off the texture and the tenderness of the meat and the pasta was cooked to al dente. The roasted garlic added that extra kick of aroma to the shrimp and chorizo, but I’d say the best complement of all is the chorizo-shrimp-feta cheese combo. I just absolutely loved it! I’ve never tasted anything like it. I just found myself chasing one bite after the other. Enjoy it with a nice and fresh buttered toast on the side to balance the mild to medium spiciness you might savour, just in case you’re not a fan of spicy pasta dishes. The next dish landed on our table – Craft’s Grilled Pork Chops. 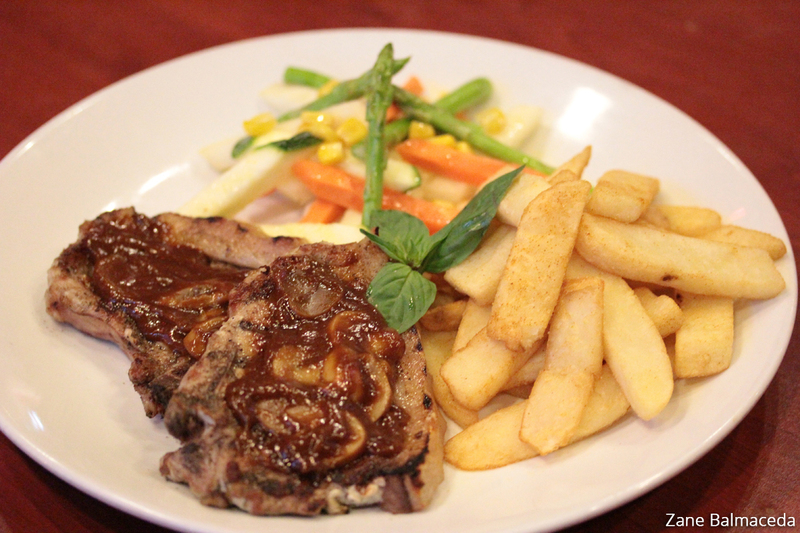 Two pieces of flame grilled pork chops topped with peppercorn and mushroom sauce. The pork chops were marinated in olive oil, basic oils and secret combination of spices. Based on my own judgment, I’d say my taste buds found some rosemary and oregano in there. But then again, whether or not I’m right, I can’t tell you as it’s a secret recipe. I tried both the mushroom sauce and the peppercorn sauce. I’d say the mushroom sauce partners well with the meat. Cooked to its most tender form and the juices are intact. Craft uses meat products that are imported and supplied by Japanese meat shops to ensure excellent quality. You have the option to replace your starch side according to your liking. You can either have the frites, mashed potatoes or rice pilaf. I was in the mood for frites to go with my pork chops. The vegetables were firm and crispy, served with buttered courgette, carrots, corn and asparagus. If you are looking for a well balanced plate of protein, starch and vegetables, I proudly recommend this fine Craft creation. I was almost full when the last dish arrived – a huge serving of Craft’s Rockin’ Ribs. The fine technique used to create these flavourful and succulent baby back ribs involves smoking the whole slab, and rubbing it with secret sauces and spices. The ribs’ meat comes off the bone easily, so eating them isn’t a hassle! I savoured the tasty ribs right to the bones. You can never go wrong with your ribs if they are cooked to their most tender form and covered with a rich and flavourful sauce. This dish, I would say is my absolute favourite. It lives up to its name – it totally rocks. Just like the Grilled Pork Chops, this plate of ribs can either go with your choice of frites, mashed potatoes or rice pilaf. This time, we went ahead with the rice. This also comes with an even bigger serving of buttered vegetables. 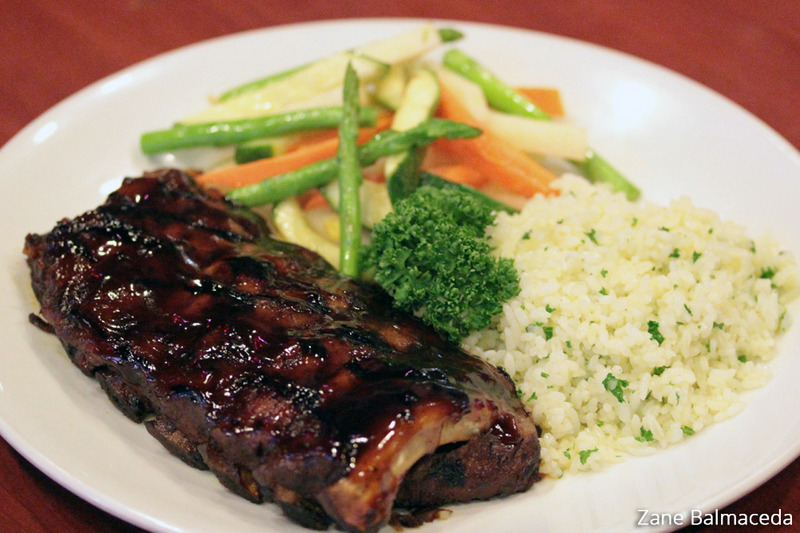 This Rockin’ Ribs totally rocked our evening. Needless to say, we still finished the whole plate even when we were already very full. 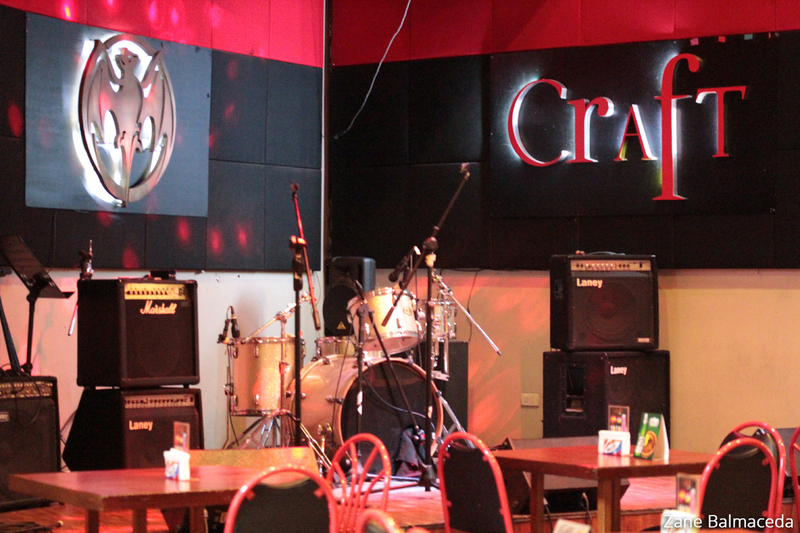 If you enjoy good food, fine service and great music, Craft is the place to be. Live music starts at 10:00pm and lasts until 1:30am. Every night is like a mini-concert on stage shared between their featured bands and big guests from the local music scene. Mondays are known as Indie Nights, Tuesdays are Alternative Rock and Wednesdays are Rockeoke Nights. They feature Acoustic Music on Thursdays, Glam Rock on Fridays, Glam-Alternative Rock on Saturdays and on Sundays, it’s their weekly Sunday Soundcheck where they host auditions for bands who want to be regular performers at Craft. Craft’s busiest days are Wednesdays, Fridays and Saturdays and an average guest spends around 600 to 800 pesos on food and drinks. 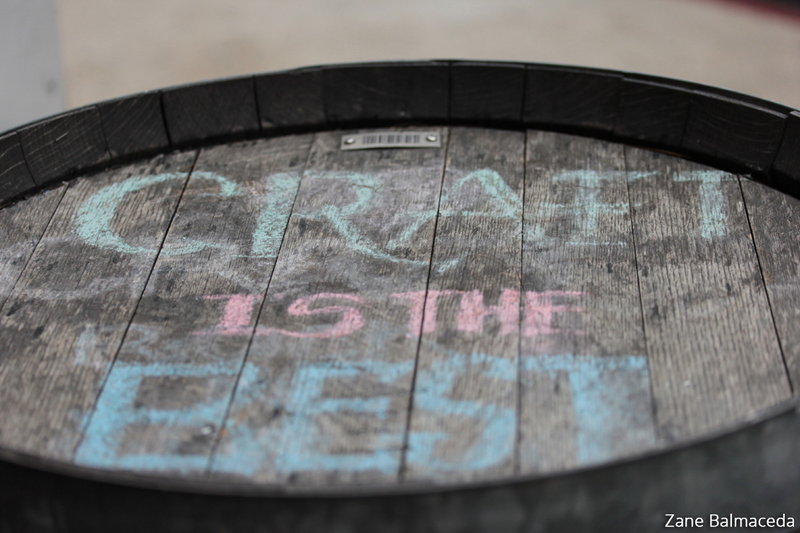 With the great food, fine service and overall experience, I totally agree that Craft is the best!